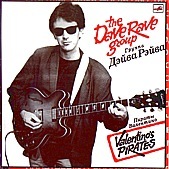 Out-of-print since 1990 and originally released only as a Russian vinyl LP on the Melodiya label, The Dave Rave Group's long lost album Valentino's Pirates is now available in the states on To M'Lou Records. A delightful collection of crunchy, guitar-driven power-pop, slow ballads, and mid-tempo rockers, The Dave Rave Group shines, proving that guitar-pop when done right, with a decade old album sounding fresh and alive today as much as it did back then, I'm sure. I'll give it an A-.